This old mill is the reason for the Algonquin Mill Fall Festival. Take nine tons of cabbage and ferment it into sauerkraut. Grind buckwheat and wheat into flour. Saw boards at an old fashioned sawmill. Embroidery a quilt. These activities from days gone by are just a sampling of what happens at the Algonquin Mill Festival near Carrollton on October 13-15. The festival began in 1971 to pay off the loan the historical society took to purchase Algonquin Mill on 3.8 acres. They wanted this historic spot to be preserved to help people understand life in the 1800s. It’s been a popular annual event ever since with 16,000 – 20,000 people attending the three day event. This 1853 bridge built by Wrought Iron Bridge Co. of Canton was still in use in the 1960s. The original old mill built in the early 1800s is their reason for being. The first two mills on this spot were driven by water from nearby McGuire Creek. Today’s mill, built in 1826, was originally operated by water. In 1890 it was converted to steam power. At its peak, the mill produced 25 barrels a day, grinding corn, oats, wheat and buckwheat. John Miday, miller, and Bill Baughman make sure the corn mill is working properly. The mill was closed in 1939 and the steam engine went off to fight in WWII. Today they use a one hundred year old steam engine to power the gristmill and grind cornmeal and flour. This one-room school is the oldest building on the property with typical pot-bellied stove. The complex contains many other buildings as well and many of them are original. The log buildings have all been brought on site from nearby locations. The one-room school happens to be the oldest of those buildings. During the festival a schoolmarm will be teaching class. Volunteers from all over the area enjoy a tasty pot-luck lunch every Thursday. They make enough money at the three day festival to support the Algonquin Mill Complex for the entire year. Their volunteers are amazing and very active as they arrive every Thursday all year long to work on projects at the complex. Many said they planned their work schedule so they could have Thursday off. Whole families get involved in helping here. 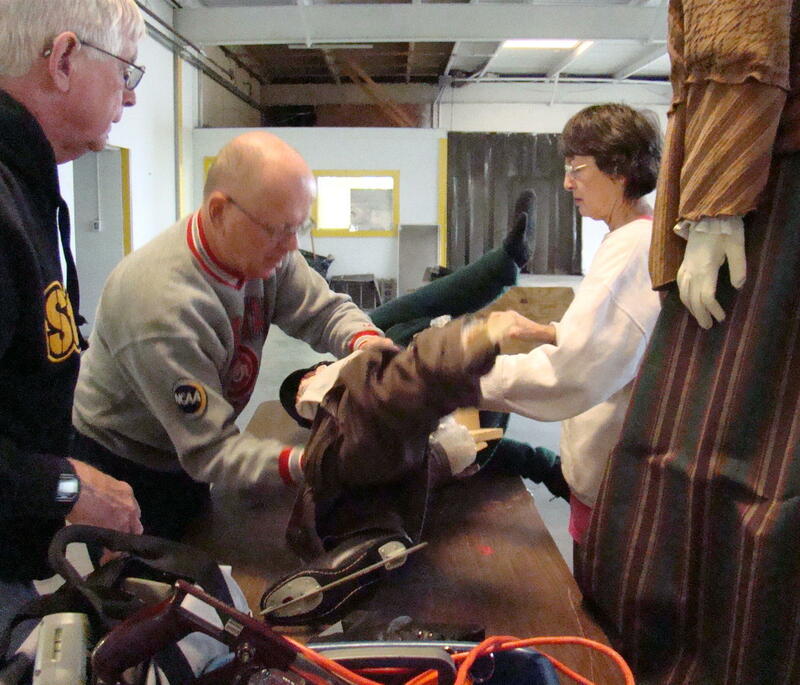 Volunteers come from all around and even though there is a large number, David McMahon, president of the Carroll County Historical Society, said they could use twice as many. One of the original buildings is now the Cookie House with the Cheese House close by. Old fashioned foods are a highlight of the festival. Pancakes, sauerkraut, apple butter, homemade jams, cider, and maple syrup are made and served. Or you can buy some to take home and enjoy. The mill also grounds fresh cornmeal along with buckwheat, spelt and wheat flour. Dave George takes his job seriously as the man in charge of the sauerkraut operation. Dave happens to be in charge of the sauerkraut and that’s no small task. When you start out with nine tons of cabbage, it takes a careful eye to make certain it ferments properly in large containers. Then it will be put in jars to be sold at the festival. Word has it that they are usually sold out of sauerkraut by noon on Sunday! This is just a small sampling of the art on display in the past. The barn at Whispering Winds Farm held square dances in years gone by, but today that’s where you’ll find an Art & Photography Show. This juried show displays original pieces created between 2014 and 2017 with no previous entries allowed. Every year it’s a whole new show, sharing one-of-a-kind items. Women embroidery a quilt and work on many crafts in the Civil War era Gothic farmhouse. You’ll discover time honored crafts such as rugweaving, spinning and quilting in the Civil War era farmhouse. The walls are covered with aprons, quilts, scarves and rugs they have made to sell. These ladies begin working on next year’s crafts the Thursday after the festival ends to refill the walls. Dave McMahon, president of Carroll County Historical Society, explains the antique Case threshing machine in their Farm Museum. Throughout the grounds demonstrations exist for chair caning, wood carving, candle dipping, broom making and blacksmith trades. An old sawmill attracts people of all ages and is one of the most popular demonstrations. This is the last original work of Mail Pouch Barn painter, Harley Warrick. There are two other Mail Pouch Barns Warrick painted at the complex. Don’t forget, all day long old-time entertainment takes place. There’ll be cloggers, banjo and fiddle players and gospel groups performing. Local high school bands and choirs also enjoy participating. If you want, you could sit there all day and be entertained. On the hillside behind this old stagecoach inn, Perry J. Vasbinder Arboretum has been established with over 400 different plantings. If you should happen to want to visit Algonquin Mill at a time other than the festival, Thursdays are the perfect time as volunteers are always there to answer questions. Of course, you can walk around the grounds 365 days a year and learn about the complex from literature available on the wall of their information center, but buildings will be locked. This festival is the perfect place to step back in time and enjoy all those old fashioned tastes, crafts, and entertainment. Entry per vehicle is $8.00 so load up the van and have a day of fun and learning. You’ll be glad you stopped by. The Algonquin Mill Complex is located south of Carrollton along OH 322, which is east of I-77. There are several bends to make on this scenic adventure no matter what direction you are coming from, so it’s best to place their address in your GPS system. Find them at 4296 Scio Road SW.
Kennedy Stone House is located at Salt Fork State Park. Visits to Salt Fork State Park should include a stop at Kennedy Stone House Museum. Built in 1840, this sandstone house today overlooks the tranquil lake. This picture of Culzean Castle shows the family’s background. The Kennedy clan originated in Scotland, where they lived in beautiful Culzean Castle perched on the Ayrshire Cliffs. Benjamin Kennedy, the original owner of this house, was born right here in Ohio in Harrison County. He bought the land in 1837 where the Stone House stands today. His grandfather, Samuel, was a well known doctor in New Jersey. It has often been said that Dr. Kennedy had the “Scottish gift of second sight”. There was a “panic” in 1837 and no one had much money. Some have wondered whether Benjamin got the money to purchase the land and build the house from his grandfather’s estate. The root cellar kept Kennedy food cool in the summer and from freezing in the winter. He hired an Irish family, who some say worked barefoot, to build him a four room stone house at a cost of $500. For another $60, he also built a root cellar to store their foods to keep them fresh. Benjamin, his wife and six children settled on their eighty acre farm along Sugar Creek where they made a living raising sheep. At that time, you could reach their home on a dirt roadway by horseback or horse and buggy. In the early years of Salt Fork State Park, you would reach the Kennedy Stone House by taking a hiking trail through the woods or arriving over the water. Today you can still use those means or if you prefer, drive down a short country lane and park very near the house. Today the view from the Kennedy bedroom shows a peaceful lake. Restoration on the old house began in 2000 by Friends of the Kennedy Stone House under the leadership of Pauli Cornish. While the basic structure remains the same, there are few original furnishings or items. Leftover sandstone blocks from the summer kitchen were used for this entrance sign. Stones left over from the summer kitchen were used to create the entrance sign for Salt Fork State Park. Little did they dream at that time that the house would someday be restored. The oxen yoke used in building the stone house hangs above the summer kitchen fireplace. Above the sandstone fireplace in the summer kitchen hangs an oxen yoke used by the oxen that hauled the sandstone to the site by the Irish masons, who built this beautiful house. All the blocks for the house came from their property. The summer kitchen was an important addition as it kept the main house cooler in summer. This trunk carried precious pines from Maine to plant at Vietta’s new home. Upstairs is an ornate old chest used by Vietta, the wife of son Matthew, to bring two pine saplings from her home in Maine to be planted in front of the Kennedy home. Both have now been removed. Visitors demonstrate how to use that extra blanket on the rolling pin bed. Upstairs you’ll find tools and information about those Merino sheep they raised. You are welcome to feel that soft wool. In the bedroom, you’ll find a unique rolling pin bed. The bottom of the bed looks like a large rolling pin. It has a blanket wrapped around it so if you get cold in the middle of the night, you can easily reach down and unroll an extra blanket. A small section upstairs gives information regarding the sheep the family raised. If you have the spirit of adventure, another path leads three quarters of a mile to McCleary Cemetery. There are over 200 graves there, most being local people. Benjamin, his father Moses, and many other Kennedys are buried in Irish Ridge Cemetery. The first people buried there were McClearys, who owned a saw and grist mill in the area. Miss McCleary, a school teacher, lived in the Stone House for a time. Sometimes she rewarded an excellent student by letting them spend the night at the Stone House. Sisters, Elaine Lipps and Jane Ransom, greet visitors and tell the Kennedy history. Now, volunteers man the Kennedy Stone House Museum from May through October. If you would enjoy dressing in period costume and telling the Kennedy story, there is a docent cabin available for volunteer use at no cost…just bring your own linens. You can then enjoy up to a week at the lake while helping at the Stone House during the day. Volunteers get to stay in this lovely little cabin near the Stone House. Presently they have forty-seven docents that come from Maryland, Virginia and all over Ohio. Their visitors have arrived from as far away as Russia and India. Recently Robert Cody Kennedy, a young descendant of the Kennedy family, heard about the house and stopped by to see the house his ancestors built. His father in Tennessee still receives an invitation each year for their family reunion in Scotland. A picnic shelter by the Stone House was the perfect place for an art class to take a break. Stop by the Kennedy Stone House Museum to get a glimpse of life in Guernsey County in the early 1800s. Sit on the porch steps and feel the footsteps of the past as you enjoy the present day view of the lake. Soak in that peaceful feeling. To arrive at Salt Fork State Park, take Exit 47 from I-77, which will be US Route 22 North. It’s approximately six miles to the Salt Fork State Park entrance on the left hand side. Watch signs carefully for directions to the Stone House once you reach the Salt Fork Lake Region. Never doubt that a small group of thankful, committed citizens can change the world; indeed, it’s the only thing that ever has. 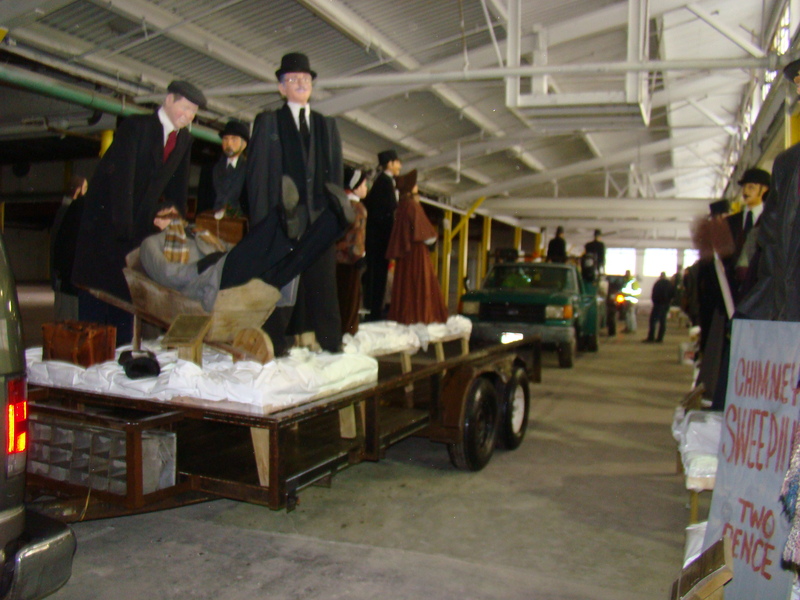 After the Restoration Team worked at Dickens Universal all summer long to make and repair heads and bodies, fix or replace clothing, and even build whole new scenes, finally the day arrived to move them to Wheeling Avenue for Dickens Victorian Village. This is no easy task to move 186 mannequins. Some of them were moved on an old trolley that was given to the village, while others were hauled on trailers. Wonderful volunteers lined up inside Dickens Universal while mannequins were loaded onto the trailers behind their trucks and vans. Usually this is done on the weekend, but due to Hurricane Sandy this year, it was delayed. So men appeared after work to load their trailers and take them to the appropriate spots in downtown Cambridge. Keeping them in order wasn’t a big problem as they are stored in order at Dickens Universal. It’s a long warehouse and there’s enough room to make it appear like a walk down Wheeling Avenue – just not as much sidewalk in between! Once downtown, finishing touches had to be made. Skirts were attached around all the scenes, most containing more than one mannequin. Then everything needed to be securely attached as a caution from further wind storms. 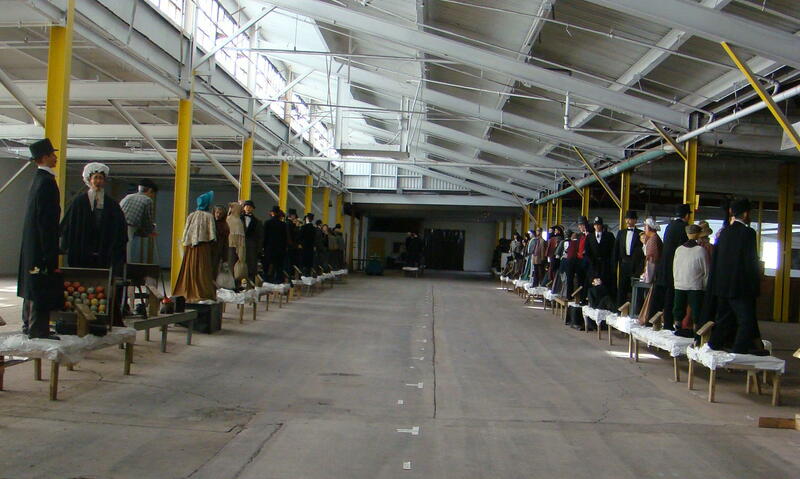 Long metal rods were placed beside some mannequins to hold them in place. But when it is all finished, the volunteers have a sense of pride in their long year of hard work to make downtown Cambridge have a festive air. Even though the hurricane had made its way north, rain still fell for the entire time of mannequin invasion. One of the new scenes, The Blacksmith, was getting its first taste of being out in the weather. Dickens Victorian Village is open in downtown Cambridge, Ohio from Nov. 2 to Jan. 5. Cambridge is easily located as it is at the crossroads of I-70 and I-77 in beautiful Southeastern Ohio. 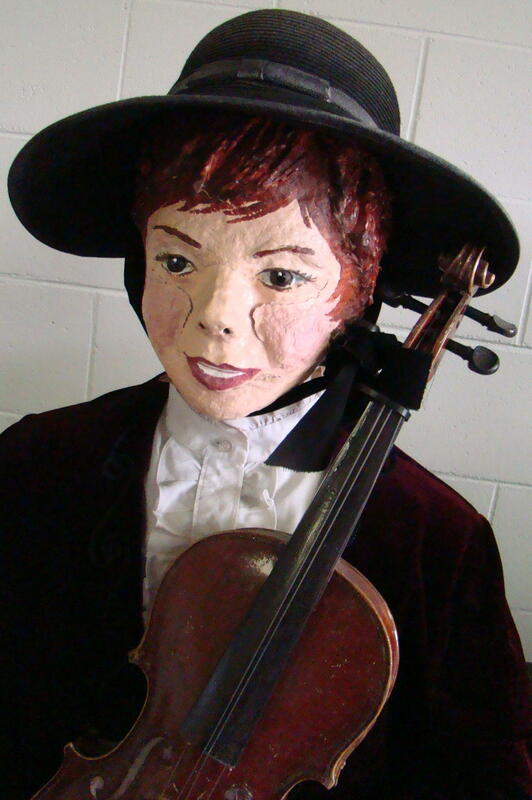 Perhaps you will get a chance to visit this holiday season and feel the Magic of Dickens in the air. The sounds of power tools, sewing machines and vacuums fill the air as volunteers have their first work session at Dickens Universal, the new storage home for Dickens Victorian Village in Cambridge, Ohio. This was former home to Universal Potteries founded in 1934 where beautiful pieces of dinnerware, tiles and even bricks were created and are collectors items today. Plans for tours of the facility are underway for both bus groups and area residents. 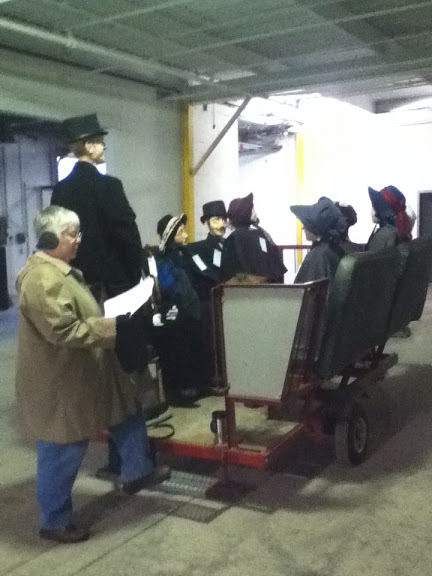 Even a trolley tour is planned for the next Dickens season. Quite often the question is asked: How do you create this amazing display? No doubt it all begins with the amazing volunteers who help all year long. 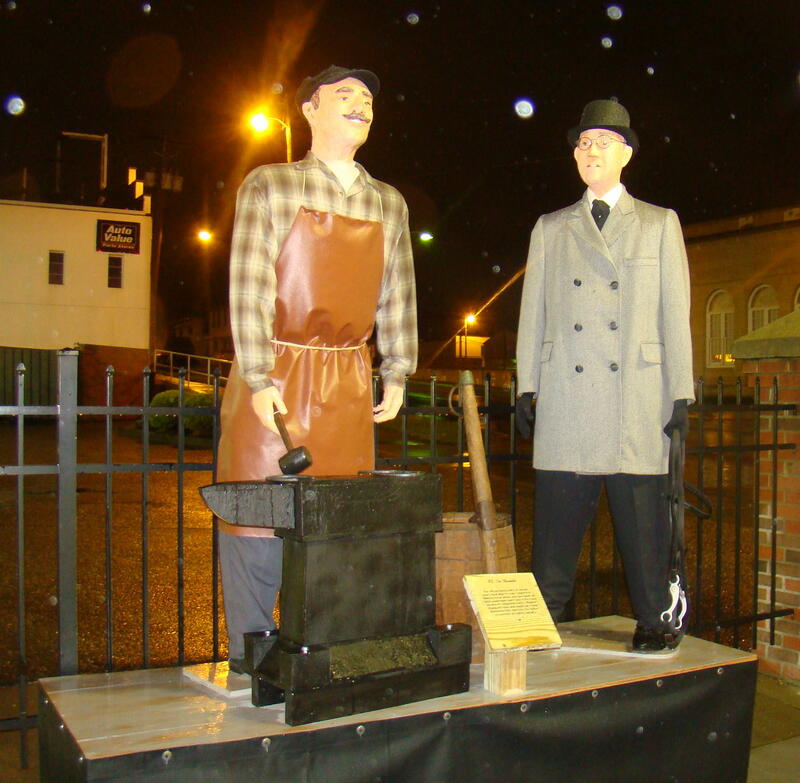 Many of the mannequins need restored so damage can be repaired from the winds and precipitation of winter months on the street. The figures are torn apart, repaired and reassembled anytime problems are noted. One may have a broken leg needing repaired, while another needs new buttons on their coat. All of this takes time and patience from many volunteers, who take pride in the finished products and the enjoyment it brings many visitors. 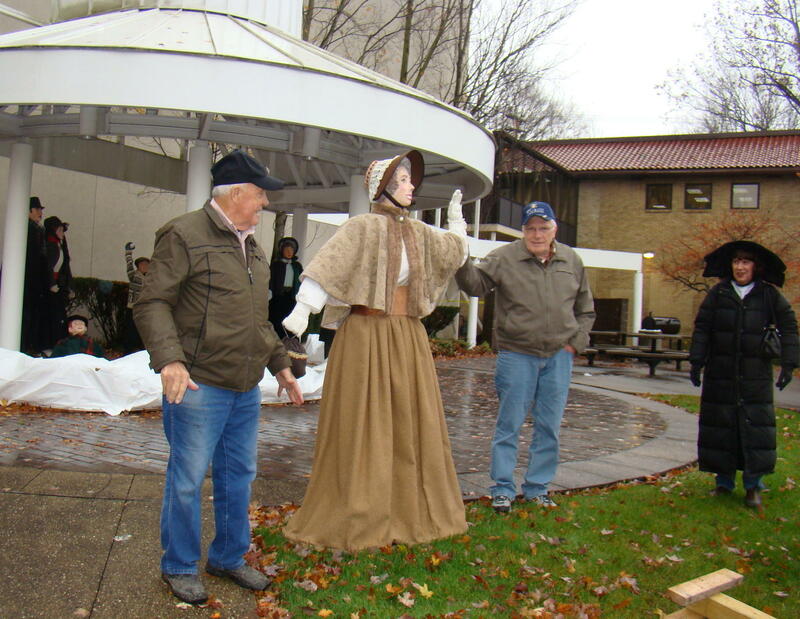 Quite an accumulation of clothing is available for use on the mannequins through kind donations from area residents and even from those who have visited during the Dickens season. 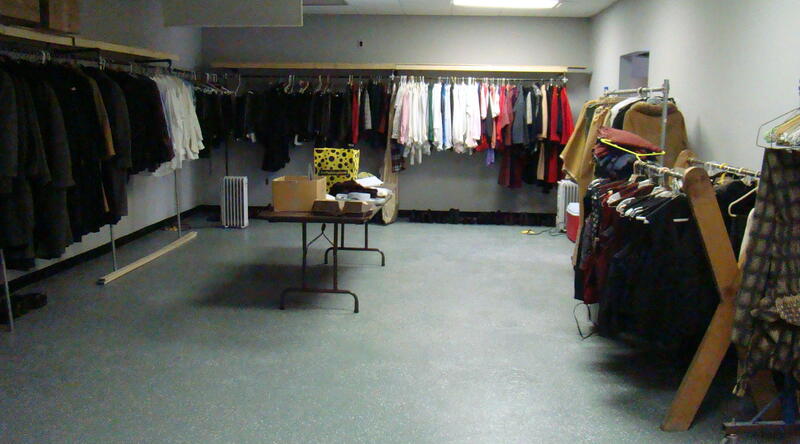 Thrift shops are frequently visited by the volunteer crew to seek treasures that might be used on the figure displays. This first night someone brought in a great pair of work boots, which may be used in a blacksmith scene. Another item was a beautiful shawl to wrap around one of the ladies, plus a blanket, which will be cut into several pieces and hemmed, for use as a throw where the figures are sitting. Another area is filled with Dickens figures sitting on table tops awaiting repair to faces that had too much winter weather. This particular face has cracks caused by the wind, rain and snow of last winter and will be repaired and repainted by local artists before the new season begins. One group removed platform attachments for dresses and the snow-like covers, so platforms could be repaired and perhaps mannequins moved from setting to setting. Some volunteers were vacuuming figures and settings so that people could work on them more easily while another group of ladies were busy cutting and sewing dresses, blankets, and coats. Dickens Universal is without question a busy place! In the center of Dickens Universal is a long, long room which they call Main Street. Here you see the figures as they will appear on Wheeling Avenue in downtown Cambridge next Dickens season, and in their proper order. This makes it easy when scenes are being switched around so they can see exactly how they are going to appear in the actual downtown setting. With nearly 200 mannequins, this is no easy task. Maybe someday soon you will get a chance to take a peek inside Dickens Universal as they create Christmas from long ago. Once you see the friendly atmosphere and experience the wonder of the project, maybe you too will want to help make this another successful year for Dickens Victorian Village. See you soon?